If your cat is doing constant scratching and licking, then it may be an indication of cats skin diseases. Cats are susceptible to skin problems, allergies, parasites, and various other conditions usually observed in humans. This type of problem is developed as a result of some other skin problems. For instance, feline acne causes the hair follicles more susceptible to infection thus resulting in folliculitis. Antibiotics can be used to treat bacterial infection. Cats also are vulnerable to pimples that usually appear around the chin. Most possible causes include improper grooming, stress, and reaction to medications. Your vet recommends gel or special shampoo to remove the breakouts. It is caused by fungus and the cats with other medical conditions are more likely to get yeast infection. Symptoms may include yellow or black discharge, continuous scratching of the ear and also redness of the ear flap. It is another fungal infection that may lead to hard, small skin lesions. Also you may notice fluid leakage from those lesions. This is one of those cats skin diseases that spread from one cat to another and even humans also. It is due to another type of fungus affects cats that are under a year old. 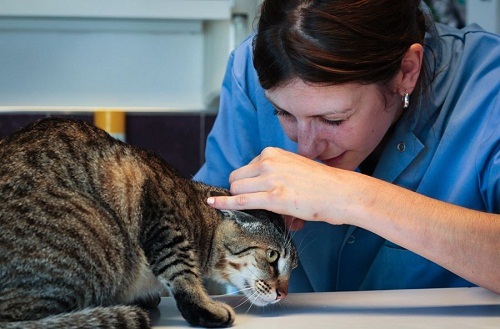 This type of skin disease produces lesions on cat’s ears, head and forelimbs. Area around the lesion may become bald or flaky. Certain grooming products, environmental irritants and certain food items can cause allergic reaction in cats. Scratching the neck or head is a common sign of food allergy.